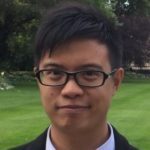 In this article, I woud like to share with you a few elements of some thoughts on probability and trading that built up through my observations of the markets over the years. I would not delve into complex mathematical concepts or formulae here but simply refer to intuitive statistics and probability. It is not my goal to deliver definitive trading edges as I would merely explain some ways to ultimately elaborate some through technical analyses and possible implementation into complex algorithmic trading systems. Before going further, I would like to make a very quick and simple recap about probability space and some parallels with real life and trading examples. The probability of an event that will necessarily occur is 1. An event that is impossible has a probability of 0 to happen. For instance, our lifespan is positive and this is obviously true. A negative lifespan is impossible and therefore its probability is 0. The price of a stock cannot be less than 0. This event is impossible, however a trading account can be negative if leverage is used and that a gap appears in a direction adverse to that of our position. This first instance brings up a first important notion, that is “integration“, meaning that a trader must incorporate different elements in its scope that are outside of the limits of the initial intrinsic market (in this case, integration of leverage skewed potential risks and profits and ultimately created new possibilities that were not initially possible). In real life, we are mostly certain to “die” with a probability of 0,999…999…; and the limit tends toward 1 given enough time. Depending on the markets we are dealing with, if we do nothing over a long period of time, it is more likely that we lose everything even though potential gains are theoretically infinite (ie. end of financial markets, bankruptcies of brokers and/or banks …). We would not be able to benefit from it anyway since we would not be here anymore (see previous example). Nonetheless, it is possible to manage dynamically our trading (profits/losses, positions …) and this is where the notion of “flexibility“ kicks in. It is preferable to speak in terms of probability space when it comes to trading, because nothing is 100% sure in the markets, if not this claim itself. We are never free from Black Swans and one of the main objectives of the trader is to find a trading edge in any market condition that would allow him or her to “play with chaos”. Repeating the same action over and over can lead to very different results that can be counted and used to create statistics. What worked in the past is not bound to work again in the future. Past performance is not necessarily representative of future performance. This is also an issue when models that are overfitted are being backtested lead to results that cannot be positively expected all time in the future. Out of sample data and time series must be analyzed, especially when other algorithms might eventually find out what our strategies are and integrate our model into theirs. There are many questions of interest that can be tackled: how is for instance short term “noise” impacting longer time frames and the latter impacting those same moves that appear at first to be very chaotic? There are indeed some correlations and patterns that are difficult to detect and define but that seem to be existent. I would like to address next a particular point that can drastically increase profits if used cautiously and correctly. What is the probability that we perform a winning operation. Likewise, what are the odds that we recoup our losses or even that we generate some profit from this reverse position? Various vital questions must also be considered: should we be correct to change our mind, when should we secure our gains from that reverse position? Can we only partially recover from our losses or is it possible to breakeven? Different psychological impacts have to taken into consideration by artificial intelligence in scalping/intraday trading, including whipsaws and bull/bear traps. We should admit and accept to be wrong and be flexible. We need to become systematically flexible because the market is always “right”. Hence the notion of “flexibility” and “systematicity“. Supports and resistances: what is the probability that they are hit? How many “hits” have to appear so that the chance of a breakout increases? We need to pay attention to the fact that the price doesn’t always stop at the same value. We should setup arbitrary zones of resistance and support (ex: percentage …). In terms of probability, we can ask ourselves what are the odds that the price remains inside a range after 4 contacts with extreme band levels? 5 contact points? 6 contact points? On the contrary, how should we interpret that if we witness 10 hits at those key levels? Are we simply observing a singular event or should we completely questioning ourselves (we are maybe seeing things that “do not exist”)? One simple example would be to consider a security which is being sold at 101 then bought at 100, to be later sold again at 101. The process is repeated 4 times. Someone who would be aware of the concept might believe there is a resistance and support at those specific levels or even better, a range. This could well be the case for a scalper, but this price action could be insignificant to a day trader who would not even consider that a pattern has been drawn. Depending on the situations (here, the time frame among other things), things can be perceived differently. Therefore, it is crucial to focus on the notion of interpretation and to dynamically adjust our methods in order to increase our probability to succeed and/or to avoid to being stopped. In fine, even some tiny tweaks could greatly impart our P&L. What is the probability that a moving average (ex: EMA20, 100 etc.) is touched over a defined period? Broken through for more than two days? A month? A year? Ten years? Many false penetrations and signals could indeed happen, and only the combination of different confirmations could correctly strengthen our opinion. A trader should also learn to recognize and use arbitrary yet popular elements of technical analysis (sets of patterns, indicators …). Would they increase the odds of “self-fulfilling prophecy”? What is the probability that a fractal pattern appears over a given period? In order for a pullback or a throwback to materialize, is it a prerequisite that price pierces through resistance or support lines (as long as a resistance or support area has not been gone through because of a price increase/decrease or a gap, this probability is 0 because this could not possibly happen if the price below/above). This depicts that many events are conditioned by other ones (cf. Bayes’ Theorem). What is also the probability that a technical pattern transforms into another one? For instance, that a triangle becomes a rectangle? Needless to say, for this situation to appear, the triangle must already exist in first hand. Dynamism, agility and mastery of the basics and statistics are fundamental. A trader must bear in mind that invalidation is as important if not more important than validation itself in every kinds of settings (patterns, strategies…). One must think about the best options available: Do we have in this case to reverse our open positions? Should we simply close our positions and take our profits or losses? Should we wait and pray instead? Is the market clearly telling us that our position is wrong? Success rate has to be constantly assessed with flexibility and free from biases. We also face the possibility to be tricked and whipsawed so validation and invalidation depends on criteria that could be either systematic or arbitrary. Time could also serve as a stop-loss. For instance, an intraday bullish flag that stretches too much over a long period of time could signal that the pattern and current targets are invalidated, or at least for the time being. Indeed, traders and algorithms often “keep in memory” targets that seem to be existent one of particular shorter time frame but that would only be “perfectly” reached much later (the following day, in a week, a month …). Analysis of this kind of delay is very important to remember as it could also add to trading edges. A second target becomes valid id if and only if the first one has been hit. That being said, this is also dependent upon the strength of the moves: Was the objective attained fortuitously? Were the momentum and/or market conviction strong? Could be it be due to some kind of overreaction or simply to the triggering of stop-loss orders? Are the moves resembling to a bull or a bear trap? Many breakouts could be false breakouts (cf. bull traps and bear traps). When a key level (resistance, support line …) is being pierced downright with low volatility in certain markets, the probability that we head further in the direction of the “breakout” gets larger in the given time frame and period of time. On the other hand, some analysts advocate that large volatility is preferable to clear a particular level. What is the probability that our trading account could survive over a certain period if a given amount of leverage is used (ex: full leverage, under leverage)? What are our odds to become a millionaire if we start with a account with 30 bucks? Billionaire? How fluctuating is our success rate and how can we improve it depending on our trading style (very short term, short term, midterm, long term). We need to involve a set of different factors such as psychological effects, position size, leverage …). It is vital to identify our profile across different market conditions and time horizons. We can also get sort the data and get the skewness (measure of symmetry or rather the asymmetry) and kurtosis (heavy-tailed or light-tailed in comparison with a normal distribution). We need to understand whether we are performing in a consistent manner or in an erratic and instable way (small gains, small losses? Small gains, large losses? Large gains, small losses? Large gains, small losses?) in order to determine our odds to reach our goals over the long haul. We could think of “random walks” that wouldn’t in fact be that random on the grounds of self-fulfilling events that would be carried out once a certain set of conditions are met. Mean reversion: Many statisticians agree that the best predictor of trading price is holds to price average. However, several markets do not reach their previous price level from where they are deemed to be overvalued before a very long period of time. Probability and market biases: Declines in price are in general faster and more violent compared to price increases. Bubbles also show several statistics such as increased steepening. Yet, this is sometimes what others try to make us believe like in a game of poker, prompting many to open an inverse position (cf. contrarian strategies). Some arbitragists are knowingly surfing this wave on purpose and inflating further bubbles. It is also a strategy used by some professional traders who are attempting to trade what they believe to be excess momentum and buy “overbought” products instead of short-selling them. What we know for sure is that trees do not grow to the sky. It is also possible that we have to deal with all kinds of cycles even though we cannot not how long they can last. How many consecutive ups and downs can we have? This would certainly depend on different elements, such as the product itself, its history and different cycles. What is the probability that a new game of poker is started and that new “normals” are emerging? What is the probability that a stop-loss is hit depending on our position or even that a CFD broker traps a CFD trader by playing against him or her (ex: B route)? What are the different factors that impact our probability to become euphoric, petrified, optimist, pessimist or angry? Long? Short? Flat? We all possess this bias and it is quite interesting to know the probability that it would change. Equity markets are structurally bullish and should “normally” keep growing for a long time. In times of panic, momentum is naturally much higher. If we do nothing, we only waste time and maybe some opportunities, but the best trade could well be to not pull the trigger at all and wait. Under which market conditions should a scalper become a day trader or hold his or her positions in swing trading or investing mode (see volatility)? Some funds specialized in algorithmic scalping might not also have the leisure to be that flexible owing to their systematic strategies unless they integrate more dynamism and adaptability in their algorithms (ie: Artificial Intelligence). Depending on personal objectives and financial capacities, it could be preferable to make long-term investments or speculations with some or all of the available capital when some particular market conditions are being met. What is the likelihood that a certain price, if reached, would attract investors or speculators? We need to take into account the speed and momentum with which we reached those targets, along with indicators and other elements in which a significant number of actors believe. We can also rely on the alignment of planets (we shouldn’t exclude spurious factors that could be randomly correlated to the result we desire to achieve). A trade should generally be jumped in when there is a high probability trade setup. We cannot be sure to always win over a certain period of time and a certain number of trades. We might as well possess a solid strategy but not be able to be filled at the price we want due to lag time and our position in the queue of an order book. Slippage can also frequently occur in particular when market orders are thrown in illiquid markets or during periods of price shocks (ex: well defined stop-loss orders are set but no buyer is willing to take our position in case of a sharp decline when we are long the market). We also need to pay attention to busted trades and non-reviewable trading ranges. Obviously, there are many other exogenous and endogenous issues that have to be dealt with. “Fat fingers” could appear, Iceberg orders must be accounted for (implementation of strategies using VWAP – Volume Weighted Average Price) and so on. What is the probabiliy that a trader in possession of a confidential information performs insider trading? What are also the odds that a broker would do front-running or that a high-frequency trader use illegal spoofing techniques and that her or she gets caught by the SEC or any similar entity? Nothing is never certain in a game of poker. As Warren Buffett once apparently said, “If after ten minutes at the poker table you do not know who the patsy is – you are the patsy”. However, like in a game of chess (or even better, a game of Go), we can analyze the different possible moves from our opponents ranging from the most probable to the least probable ones. That way, we can become prepared and able to react properly according to the scenario that is unfolding in front of us and the constraints that we have. Therefore, we must take into consideration several dimensions and dynamics that keep changing incessantly in real time. Black Swans are also very important and interesting to analyze. Through repeated observation of price action and price reactions to different possible situations, it is likely that we detect numerous elements that are not bound to randomness or coincidences. Many critics pinpoint that technical analysts mostly or only swear by charts and other mathematical indicators on a standalone basis to trade the markets and that fundamental analysis should always be taken into account to set up a strategy, among other things. Both schools certainly have their own merits and I will not lit more fire on this debate. In this article, I would like to attempt to “forecast the future with some degree of probability” by combining both tools to provide a potential strategy that has never been mentioned publicly to my knowledge. I wish to apply technical analysis to the US ISM Manufacturing Index (or PMI Index) which pertains to the realm of fundamental analysis and the economy in order to predict in an avant-gardist way potential market turns in American stock markets. I will select the SP500 as it regroups 500 American companies that are in my sense more globally representative of the US economy, versus the NASDAQ or the Dow Jones which encompasses a fewer number of elements. Without going into further details, the charts approximately exhibit the same reactions and patterns in comparison to one another: most of the time the ISM Index showed negative signs and trends (in red), the stock markets also tended to follow. That was particularly apparent after the Dot-Com bubble popped in 2000-2001 or the aftermath of the financial crisis in 2008-2009. The ISM and PMI indexes highlighted fundamental issues that were accompanied with sharp declines in the markets. However, like with the egg or chicken causality dilemma, it is not exactly clear which one triggered the other. Common sense would dictate that those specific fundamental data serve as leading indicator, hence contribute to the debacle. Nonetheless, it is quite possible in my view that American indices were themselves the bird of ill omen that prevailed in inducing the further deterioration of the ISM index. This could come as a boon to help forecast possible scenarios as we shall see later. It could be also of interest to check how the EUR/USD currency pair and Gold (XAU/USD) performed throughout the same periods. From what is shown above, the relationships between the data are less obvious based on the sole information that are provided here besides the collapse of nearly every single markets during the financial downturn from the Subprime Mortgage Crisis in 2008-2009. Before going further in describing how to potentially use the ISM Manufacturing Index to draw up scenarios, I would first like to briefly explain some related key points. As mentioned earlier, the ISM is a good leading indicator of the economy’s momentum. It could be helpful in assessing the GDP growth and finding turning points in business cycles since it provides timely information on manufacturing and that it possesses a strong correlation with manufacturing industrial production. Stock markets are bound to a sound and healthy economy as this would translate into larger profits for companies. On the other hand, bond markets tend to be more positively correlated to a slower growth as they are extremely sensitive to risks of an economy that would rise too fast and cause possible inflationary pressures. The FED also follows and scrutinizes the ISM reports very closely as it could influence how it would set future interest rates itself. We must also pay attention to the fact that stock markets could still rise whether the ISM index is lower or higher than expected. Indeed, they would tend to increase with bond markets as lower interest rate could be positive for the markets as well. The effects of technical evolution and improvements in production are not explicitly taken into account, which makes it possible for production to expand while the employment recedes. Furthermore, the survey participants are limited to merely three responses (“slower”, “faster” and “same”), which indicates that the ISM Manufacturing Index is a diffusion index as it measures the breadth of change across manufacturing and not the rate of change in manufacturing. Going back to the strategies I would like to underline, it is possible to test the correlation between the data evolution and the SP500. Some would check the troughs and peaks in the ISM/PMI indexes and buy the markets when the first ones bottom on a monthly basis then close and reverse their positions when they top. Now take a closer look at the SP500 (weekly). I have also plotted below the chart the ISM Manufacturing index as an indicator which fluctuates around the 50-line (as of December 1, 2017): every number above should be considered as positive for manufacturing and vice versa. Please note that neither the ISM Non-Manufacturing Index nor the PMI index is considered here. We should also bear in mind that the US economy could be still improving as long as the ISM Manufacturing index (which we will simply call the ISM Index in this article for the sake of simplicity) is rising from 43,3 for at least 9 consecutive months. In this case, it is services that are mainly driving the American economy. So back to our business, what could you see and tell from the following graph at first glance? It is interesting to see that almost every time a divergence between the SP500’s nominal price and the ISM index occurs, that is to say when they are going in opposite directions, sharp reversals are to be expected. Convergence (both price and the ISM Index are heading the same way) on the other hand, confirms a strong trend. However, why didn’t the SP500 plummet in 1995 and skyrocket instead? An 8-year “cycle” was deliberately selected as price sustainably grinded up while there was an apparent divergence spanning over the 1987-1995 period. Indeed, we must pay attention to the 4-year divergence cycles instead of longer periods if we want to achieve more precision. According to some personal analysis and trial backtesting, I managed to find out that it is possible to break down at first the American stock market and ISM index cycles into two overlapping 4-year periods which I coined “The 4-year Convergence/Divergence Cycles Hypothesis”. Let’s delve into some further analyses based on this prime idea. Overlapping 4-year convergence/divergence cycles allowed to find mini 7-month cycles that helped to predict large drops or even major crises as we shall see later. Their selections are based on study of the joint behavior of both price of the SP500 and the ISM Index. Further explanation to help understand my choices will be provided later on. Back to the reasons why the markets did not plummet in spite of an 8-year divergence, if we split the difference that is to say in two shorter 4-year time windows, we can find out that the 1991-1995 period shows an intriguing “double convergence” (price and both positive and negative ISM momentums are practically parallel). This will indeed call for the beginning of one of the strongest and apparent price dynamics upwards of the end of the last century. This further strengthens the fact that it is more insightful to perform analyses on shorter periods to explain the past, hence giving more credit to the first hypothesis. It is crucial to carefully pick the cycles and find the “true” troughs and tops in divergence and convergence analyses. Sometimes, cycles seem to be either shorter or longer. In the previous graph, we could detect that price rose in about the same fashion (slopes are almost similar) during the “red” 4-year cycle between March 1991 and March 1994 while the higher highs of the top and the lower lows of the bottom parts that oscillate around the 50-line of the ISM Index were respectively stretching over a 3-year and 5-year window. This type of anomaly could confirm the validity of an extremely predictive double convergence and help foretell what I call a “paradigm shift”, which could be explained either by some critical positive fundamental news or some market actors’ exaggeration (ie. extreme optimism, see behavioral finance). As one may notice, the slope of the SP500 between the end of 1995 and 2000 (another red 4-year cycle) became even steeper. The 500 price level which was attained prior to the impulse acted as a very powerful price floor since the SP500 never reached those levels again so far, hence again confirming the change in fundamentals in the US economy and financial world. However, these cycles will be challenged as we shall see later. I would like to introduce another concept from technical analysis but I will push it further with an attempt to use it to predict the future. I will here call in the “Convergence/Divergence Pivot Line Hypothesis”. I will present special pivot lines or crucial levels that will be used as turning points for mean reversion (50%) purpose: whenever the price of the SP500 crosses above those lines, it is expected to reverse the sooner or the later and retrace at least 100% of the previous move. The correct price legs could be difficult but not impossible to find as we will see in the potential scenario case shown at the end of the article. Nominal price could of course go way lower than the original 100% target after it is hit in the future and reach tactical levels (ie. Extended Fibonacci levels). The way those “Major Pivot Line” were selected was based on a few conditions: the stock market index has to be erratic but must ultimately remain at the same price at the beginning and end of the 7-month window. The pivot lines were traced at the last price at the end of the “red” 4-year cycles whenever those conditions were respected. This allowed finding the tops and lows of the 1987 and Dot-Com bubble crisis. Relying on this technique, I drew a hypothetic pivot line at around the 2000 level. Still, we must remember that markets players are extremely competitive and it might not work after two or three times. “Fool me once, shame on you; fool me twice, shame on me”. This brought up a challenge to the way of defining the cycles, which will be explained later. As we can see in the following chart, the theory and hypothesis regarding the input of Major Pivot Lines is confirmed in a first way. Set at 275 in this chart, it acted as the mean level between the top and low of the bullish move and correction. This helped speculators to set both their short-selling and buying price targets in an extremely precise manner. You are also able to see a confirmation of the Dot-Com Bubble Major Pivot Line that stems from the leg originating in the second part of the Paradigm Shift. Price started to wave in a more volatile and chaotic way as they tried unsuccessfully to correct several times between 1999 and the beginning of 2001. Tracing the pivot line using the peak of the bubble helped again to set the target at around 856. In 2009, the pivot line proved once more to be useful to get the price of the very bottom before price started to rally by using the 127,20% Fibonacci level of the exact same range. Even more interestingly, the “Convergence/Divergence Pivot Line Hypothesis” appeared to be more prominent than the mean reversion strategy based on candlestick momentum that I will not detail here. Based on this particular method, the original target was supposed to be 561. But as stated earlier, the Paradigm Shift acted as a floor and the targets of the Pivot Line proved to be the right ones. In case of an extreme crisis, this level could be future “catastrophic scenario” price targets and unique extremely good buying opportunities. You will find next a slightly more comprehensive analysis of the different reactions of the SP500 within the 7-month windows using the “Overlapping 4-year Cycles Hypothesis”. I also performed a convergence/divergence analysis of the “blue” 4-year cycles which revealed different confirmations of the previous assumptions. Those postulates are, again, induced by reverse-engineering and empirical observations of the past. Please see the chart below for more details. and reactions of the markets within the 7-year windows. Please note that no Major Pivot Line was traced in 2007-2008 because the condition of price similarity at both the beginning and end of the 7-month period was not respected. This proved to be correct as the financial crisis hunted the different Fibonacci levels from the Dot-Com Bubble and sought to hit stop-losses before the smart money could kick in and short-squeeze the SP500 at exactly the 127.20% Fibonacci level, that is to say about 666,66. It is fairly interesting to see that the SP500 managed to “create” a double top and strengthened the fact that the markets could be shorted as price kept slowly grinding up but in a very erratic fashion after the end of the “red” 4-year cycle inside the 7-month window. Now, how could we set potential targets if we were to focus on the hypothetical Major Pivot Line at 2000? Before going further, I would like to discuss about anomalies that could be found and challenging the aforementioned hypotheses. It is possible that two “4-year” cycles slightly overlap, as between 2007-2008 (interestingly enough, that appears during the crisis). It could be of great interest to check whether the 4-year cycles have been delayed (shifted to the right) to improve forecasts. Quantitative Easing was also a huge game changer. I believe that the market cycle became overextended by another year because of this new paradigm shift, which assumption I will call the “Quantitative Easing Cycle Shift Hypothesis”. It is also important to not try to “over fit” the data and cycles as the span of 4 year is roughly an estimate. We will see possible interesting information arising from those points. End of divergences may sometimes take more prominence than ends of cycles. Both have to be analyzed. The following conclusion replaces the previous one that sets the Major Pivot Line at 2000. For the time being, the new hypothesis does not invalidate the previous theories. We must bear in mind that the way markets collapsed in 2001 and 2008 is different in terms of velocity and momentum. Markets were sold step by step in 2000 and it required 3 years for global equity markets to hit their bottom whereas the SP500 plummeted in a very brutal fashion in a span of a single year. Those market chocks fundamentally changed the world of finance and triggered the implementation of the Quantitative Easing in the US. By using the same method and simply delaying the cycle by a year, it is possible to find the new hypothetical Major Pivot Line. Considering the first hypothesis that states that the ISM/PMI indexes are following roughly 4-year cycles and the third hypothesis which speculates that Quantitative Easing has delayed them, we can define the pivot line that was originally set at around 2000-2005 to roughly 2135-2138 by shifting to the right the convergence/divergence time frame by approximately a year from about October 2015 to October 2016: markets had to readjust the cycles. We can also obtain some confirmations through the visible price spikes between a new strong support area at 1810 and 1822 that occurred inside that specific one-year window. One surprising finding further pinpoints the validity of this assumption: If we set the two previous Major Pivot Lines and the new hypothetical Major Pivot Line together, we can observe that the Dot-Com Bubble Pivot Line exactly sits in the middle (50%) of the Black Monday Pivot Line and the new hypothetical one. This coincidence should not be taken lightly as major reactions were indeed triggered inside the zone around 2138. However, invalidation of bearish patterns and, through snowball effects, confirmation of bullish patterns in addition to the election of the US president Donald Trump spurred an extremely strong bullish trend in 2017. The slope turned even steeper and the “Christmas Rally” propelled the US markets to even higher all-time highs in the lowest volatility environment we have ever seen since the past 25 years. Important: If not valid, the scenario has to be reconfigured by tweaking the targets, as I did in the edited Adjusted potential scenario below. The process is the same. Caution should be applied with respect to behavioral biases. Based on solely those specific hypotheses, personal experience and a few basic tools, I came up with a first potential scenario in which I am relatively confident in. It must be further added that I do not possess a crystal ball: I could either be wrong or right. But in this configuration, I am more confident than usual in the outcomes. The 2695 price level should be “played” and any strong invalidation of the strategy should not be taken lightly as it would have to be reassessed. My bold strategy is to attempt to pick the top ahead of the markets before any supplementary confirmations kick in. As we will see later with the adjusted version of the scenario, the 2695 level was a trick but we can see how to act and benefit from it. Let’s go back to the thought process with the original target in mind. The idea is substantially the same. Put options with maturities ranging from 1 to 3 years can be bought and call options can be sold. Short-selling SP500 Futures or developing a strategy that is tilted towards a bearish bet at those specific levels (end of 2017, that is to say, at the time I am finishing this article without the edit from January 18, 2018) could be undertaken with potentially a higher risk/reward. In order to find possible targets, we can for instance confirm the different ideas at the same time with Fibonacci levels, Elliot Waves and patterns among other things. I will use here the potential pivot line at 2138 that will act as the 50% Fibonacci line for mean reversion purposes, based on the cycle and convergence/divergence analyses of the ISM and SP500 indices. 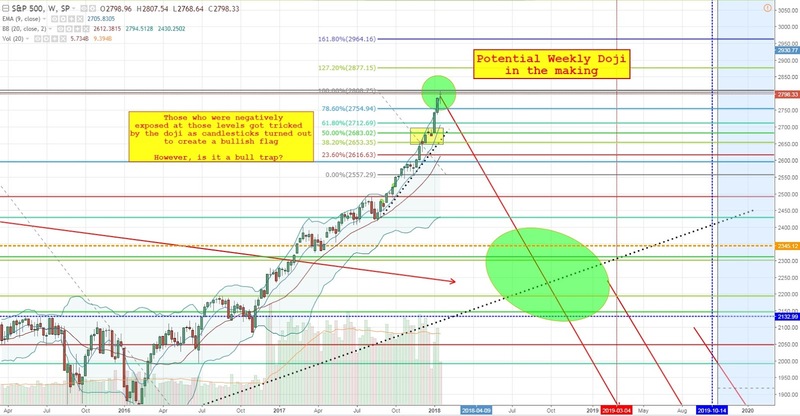 By using Fibonacci retracement lines, we can set a potential top of the American stock market and ISM cycles by considering the SP500 top at around 2695 and its first low at 1809. In case of a strong panic, 1568 then 1261 could be targeted. In the worst case scenario, 871 (see next chart) or even 561 (see the previous chart on mean reversion strategy) are the ultimate objectives. The pivot line at 2135 could therefore be the first target if short-selling is considered at this stage. Some relatively short spikes could also happen in the 1810-2000 and 2138 areas in my opinion for various reasons such as 2000 being a key level and previously a “regular” pivot per the original Convergence/Divergence Cycle and the Overlapping 4-year Cycles hypotheses on a standalone basis. Going through the major diagonal support shown in the second graph below in addition to Fibonacci retracement levels could also explain those future potential moves. I have displayed a theoretical potential scenario resulting from the different ideas that I have spawned. I also plotted the weekly 100 EMA and 200 EMA (Exponential Moving Averages) on the chart. One important key takeaway is that the weekly 200 EMA served as a major support and should certainly do so again when the markets drop again. It is crucial to keep a prudent eye on it: should the markets go much lower, then a quick collapse in the world of equities would be quite possible. The picture shown above strongly confirms the 1227-1274 target area from the previous chart as there is a price confluence there. Hence, we may safely assert with a certain degree of probability that we may have correctly drawn the hypothetical Major Line and found one if not the potential top of the SP500 at around 2695. Note from the next picture that the markets could pierce the diagonal support at exactly the 50% level of the first down move, which could validate once more the Fibonacci levels, the hypothetic Major Pivot Line at 2138 and the first target at around 1809. This follow-up was added on January 18, 2018 after shorters struggled at 2695 and many stop loss orders we forced out. By using new Fibonacci retracement levels thanks to price discovery through the setting of new all time high, we can redefine our targets (click on the pictures to enlarge). 2807,54 could be the new first potential top, solely based on the premises I have outlined. However, based on the update and the bullish flag detected below, 2834,8 could even potentially be the next true top. The 50% pivot level would still be at around 2133, and the first target at 100% would be set at between 1460 and 1470. The 127,20% retracement is at about 1100. In a catastrophic scenario based solely on the following picture, , the 161,80% level at around 635 could be in the crosshairs. Now, let’s zoom it a little bit to get more granular details underlying the assumptions. As one could see on the picture, a potential weekly Doji is being created. We need to get more confirmation by the end of this week (January 15, 2018). This could be a harbinger for the markets to make a reversal. Relying again on charts and patterns, we can notice that a bullish flag was drawn exactly from our previous target at 2695, which could explain the increase of momentum that occured recently as stop loss-orders were trigered. This could however be considered a boon to short again as the target of the pattern has probably been hit. We could therefore potentially see that people were caught in a bulltrap in the next months, should the American markets make a reversal. SP500: Bull flag and bulltrap? Let’s zoom further and see a daily chart of the SP500 with the bullflag in question. Keep in the mind that we could redefine the targets more precisely and that 2831.8 could even be hit, hence tricking further people who shorted too early should the market invalidate the Weekly doji. This is a pure game a of poker and chess! Last but not least, it is very intriguing to see a 12,5-year ISM Index pattern similar to the one that shaped through the 1991-2003 period appearing (see the yellow areas). Should the past repeat itself, we could predict a sharp reversal of the ISM Index which should plunge below 50 in the coming years, thus exacerbating the acceleration downwards. Furthermore, price targets and cycle timing are aligning with this new assumption. Using this one additional forecasting “technique”, combined with technical analysis and other fundamental tools and data, it is possible to create the scenario described above. The current Christmas rally could potentially offer an excellent short opportunity with a good risk/reward ratio especially if price goes above 2695 in this case. Please bear in mind that markets are dynamic and conditions keep changing. Analyses have to be adapted accordingly as new price levels are hit, whether they be new all-time highs or support/resistance areas. This is what I call the “Price and level discovery concept” which induces that upcoming price action and new price information can help predict and either confirm or contradict a forecasted future.